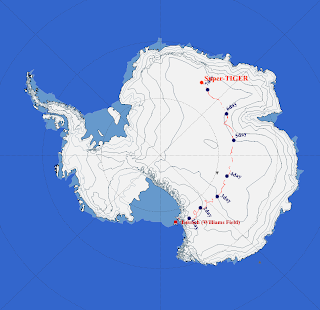 A little over 7 days in, Super-TIGER is on the other side of Antarctica from McMurdo. We've been keeping track of it around the clock, with our McMurdo shift remaining in the evening. The last couple of nights have been relatively uneventful--mostly just dealing with changing satellite links as we move in and out of view. Friday I climbed Observation Hill again and there was a slightly better view, but nothing too exciting. EBEX and BLAST both passed their hang tests and could be launching soon. We're also almost to the point where we start losing people--this next week, Richard leaves McMurdo on Tuesday, followed by Bob on Wednesday, Kenichi on Thursday and Makoto on Friday. That will leave just JohnE and I left until early January, when Thomas and Sean return.